I failed at lent this year. I am no longer religious. I am no longer a practicing Catholic but I like lent. I like the concept. Lent requires that you do something difficult- that you give something up. I was supposed to decrapify my life by getting rid of a bag of stuff every day for forty days. Stuff I don’t need or use. Stuff that clogs my mental arteries and scatters my brain by taking up space that should be empty and free. My third floor is cluttered with crap. Stuff I was going to sell, stuff I don’t use. I have overflowing shelves and too many junk drawers. And yet I didn’t let go. I only got rid of about 10 bags. Why do we cling to things that hold us back and make our vision fuzzy? Ironically, perhaps, this post is my first assignment for my Writing 101 class offered by WordPress. We are supposed to free write for twenty minutes and not worry about editing. Just write. Don’t edit. That is hard. That is vulnerable. But it is also essential for my own personal resurrection. Sometimes we kill parts of ourselves before they have a chance to really live. Our quest for perfection becomes a stranglehold, a creator of paralysis. I wish I had heard Ira’s quote and really embraced it 20 years ago. I wish I had determined to write everyday regardless of the quality with the knowledge that- 1) I could edit later and 2) with time I would improve. Not writing for so long when the desire to do has been one of the few constants in my life was a mini-murder, a little suicide. But this post, this unedited effort (that most definitely could be done much better) is a new beginning- a resurrection. I am back. Hello. 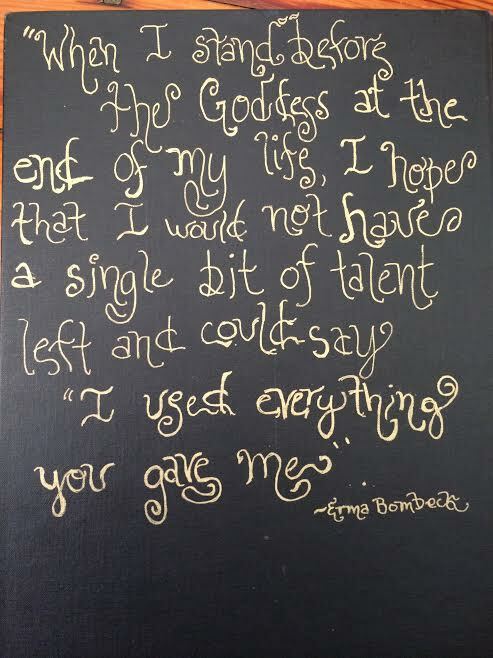 This entry was posted in Uncategorized, Writing and tagged blogging, Edit, Erma Bombeck, Free Write, Ira Glass, Lent, Reinvention, self improvement, Writing, Writing 101, writing challenge. Bookmark the permalink. Post a comment or leave a trackback: Trackback URL. I would hardly call 10 bags of crap of failure. Welcome back! Hi Marissa, Thanks! Well- ten bags is better than nothing. I guess I fell prey to wanting to see total transformation all at once….. I really need to be more ruthless with this crap in my life! I know what you mean. I’m really bad with clothes and I just look at my closet and think to myself ‘that’s it! if I haven’t worn it last season it’s going in the trash!’ Then I start packing it into bags and about half of it goes back in my closet! Oh, thank you! Still have the wedding dress. I got rid of a lot of rock shirts and really regret it!! It is a bit freeing, though, isn’t it? To write and not worry about editing? To just let your thoughts go and not worry about the outcome? Good post for this exercise. It is liberating. 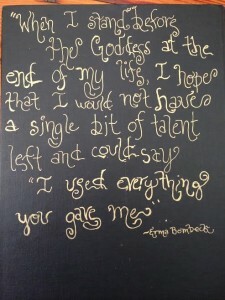 I am committing to doing some free writing everyday actually. I am going to write a post about it soon…. I agree 10 bags is no failure. My husband keeps so much and I keep getting rid of it as we do not have room and usually do not need it. Hi Donna, Thanks. I am so much happier when I have less clutter. It bogs me down. It makes everything take longer. I am still determined to get rid of more. Ten bags is awesome! I’d celebrate the success! I liked the quote, “Sometimes we kill parts of ourselves before they have a chance to really live.” a real nugget. Hi Lilypup, Thank you. Excellent point about building momentum. That has happened for me in the past and I sincerely hope that it does again. Thank you for sharing your feelings and your ten bags. Your thoughts were an encouragement to me. 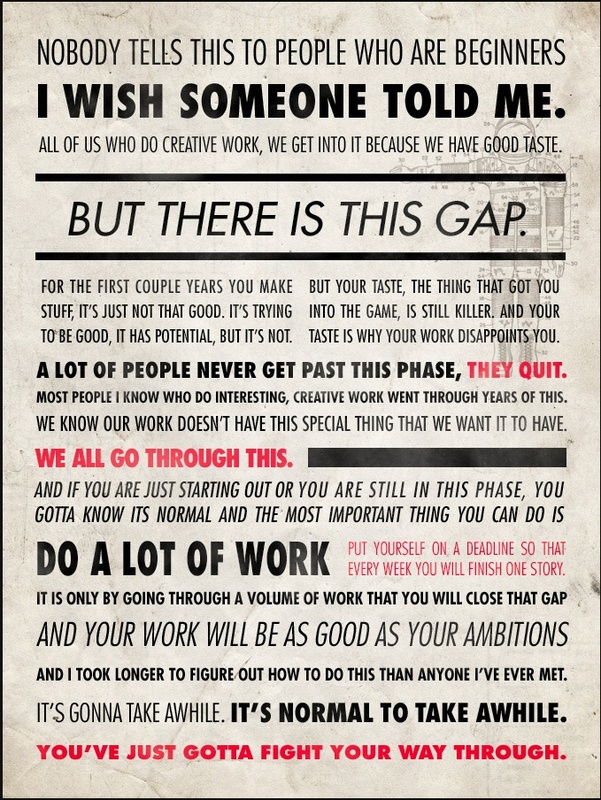 Great thoughts…I love love love the Ira Glass quote too. Looking forward to more from you! Thank you! And the Ira quote really is great. I’ve been blogging for a while, and at some point I decided to not do a whole lot of editing, other than spelling and grammar. I have no interest in being a “real” writer, and I try to keep blogging as something that is purely fun for me. So I’m always mindful of the amount of time and effort I put into it, asking myself questions like “why am I doing this?” and “is this time well-spent?”. Hi Miriam, Thank you for this comment. I agree completely that writing regularly is time well spent. And that also, there is only so much time in a day. So asking ourselves “why” is important. I was an English major in college and have definitely dreamt of being a “great writer.” Sometimes I think too much about things and hold myself to standards I haven’t yet earned through proper effort and that can be paralyzing and limiting. 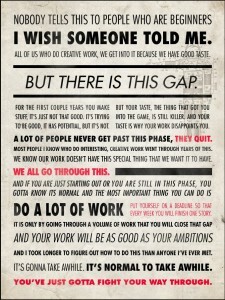 That is why I really like the Ira Glass quote in my post. I really need to, as Ira said, “do a lot of work.” As for your blog- I love it. I love your openness and honesty and I feel really appreciative of being able to read your about your journey and all the insights (as well as questions) it has given you. I wish I had not started writing when sixty-three, but had kept trying from my school days. For one thing, those nascent emotions will never come back. I will not know again first-love, or wonder at my first-child, and be able to write about the thrill of them. Also, I will never know what went through my mind when it was more flexible and, probably, more agile. This is such a great point. I haven’t been writing or blogging at all recently. I recently signed in and started looking around again and this comment struck me. I will start again! 44 is better than never. I hope you are well! !